I can’t, but I remember saving up my ‘sweet money’ from my grandma and spending it all on The Baby-Sitters Club and Sweet Valley High books! I actually gave away 500 books when I moved a couple of years ago as there was no space for them – very sad! I still have around a thousand though, they’re absolutely everywhere. I have three shelves above my desk for books that I’m likely to use in some way whilst working. Mostly plays and poetry books. The rest are organised into classics – mostly Ancient Greek, Roman and Shakespeare, and then poetry, fiction and non-fiction all get their own shelves too! I follow all those book people on Instagram though so I do hold dreams of having colour fade bookshelves one day! No, but I really should. Books have always been my most treasured objects so even if I haven’t enjoyed one, I still justify keeping it somehow! Favourite bookshop, new or secondhand? I love pretty much every independent bookstore, new or secondhand. It’s such a labour of love from the owners, how can anyone who adores books not? But Waterstones Piccadilly and Foyles on Charing Cross Road are both very special to me as I worked in those areas in nightclubs and strip clubs for ten years before writing was a financially viable job, and before my shifts I would saunter around in them, anonymous in their vast spaces, always discovering new books to buy or read in store. Ah, so much! I have a whole wall of shelves dedicated to ‘to read’ – it hasn’t been just a ‘pile’ since I was a teenager! Off the top of my head I have Aurabel by Laura Dockrill, The One Who Wrote Destiny by Nikesh Shukla, Mothers by Chris Power, Islam in Performance by Ashis Sengupta, The Yellow Wallpaper by Charlotte Perkins Gilman and Barber Shop Chronicles by Inua Ellams. A Penguin Classics deluxe edition of the Odyssey by Homer which my college Classics teacher, Angela, gave to me, with a speech of encouragement and belief that pushed me to apply to universities I wouldn’t have dreamed I could attend. Break, bend – a flexible spine is a flexible mind as they say in yoga! And annotate, all over; I am that person – but only in my own books! Yes, and then I inevitably buy them again! I think my mum is the only person I know who always returns a borrowed book. I love it. Especially if I know them. It’s such a huge achievement to complete a book and have it published and then for somebody to be buying it. I feel so honoured to be a minuscule part of that journey, a reader of the words written by someone with so much going on in their life and mind; their signature highlights all of that for me. Sabrina Mahfouz will be appearing at My Side of It: Poetry Night (Sunday 29 April, 5 p.m.) – an evening of reflective and galvanising poetry from Sabrina Mahfouz, Suhayma Manzoor, Momtaza Mehri, Hodan Yusuf and Aliyah Hasina. Hosted by the arts writer and activist Zahra Dalilah. MFest, the UK’s first dedicated festival of Muslim culture, literature and ideas, will see 25+ events taking place at the British Library this weekend (27–29 April). For more information and tickets click here. 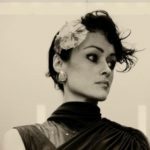 Sabrina Mahfouz is a poet, playwright, librettist and campaigner. She was raised in London and Cairo. Her plays include 'With a Little Bit of Luck' (Paines Plough) and 'Clean' (Traverse Theatre), which transferred to New York in 2014; Her poetry includes the collection 'How You Might Know Me' (Out-Spoken Press). She is the editor of the literary anthology 'The Things I Would Tell You: British Muslim Women Write' (Saqi Books), which is currently longlisted for the Grand Prix Literary Associations Prize. She works with a number of international charities and received a Fringe First Award for her play 'Chef' and a Sky Arts Academy Award for her poetry work, which has been produced and performed on TV, radio and film. Her first play for children, 'Zeraffa Giraffa' (Little Angel/Omnibus), adapted from the book by Diane Hofmeyr and Jane Ray, is currently nominated for Best Production for Young People at the Off West End Awards. Sabrina has collaborated extensively with dancers and musicians, including writing for ROSALIND (James Cousins Company) and I Imagine (Aakash Odedra Company) and is an Associate Curator at Science Gallery London, for whom she has written a pamphlet of poems called Bloodlines. Her work has appeared in award-winning anthologies including 'The Good Immigrant' (Unbound), 'This Is Not a Border' (Bloomsbury) and 'Here I Stand' (Walker Books). She is currently working with Cambridge University Philosophy Department to write poetry around consent and is the librettist for an opera adaptation of 'Woman at Point Zero' (Royal Opera House/Shubbak/Aldeburgh).